DAY 1 – Prepare yourself for an adventure full of Alaska hiking and kayaking over the next two weeks! Your guide will pick you up in Anchorage at 8am for the scenic drive through the Chugach Mountains to Chitina, at the edge of Wrangell-St. Elias National Park. Fly into McCarthy on the first of several spectacular scenic flights, go over your gear with your guide(s) and prepare to depart for Iceberg Lake in the morning. Accommodations and meals at a local lodge included. DAYS 2-5 – Iceberg Lake Basecamp – Fly in by bush plane to spend four days in a remote valley of the Chugach Mountains. A wide variety of hiking options are available, from moderate wandering along the valley floor to hiking though alpine meadows to climbing the surrounding peaks and crossing glaciers. Your guides will set up a comfortable base-camp from which to explore, and cook warm, tasty and hearty meals morning and evening. Return to McCarthy the afternoon of Day 5. Lodging and meals included again this night. DAY 6 – After enjoying the comfort of a real bed and (several) hot showers, you’ll have the choice of several activities on this “in between” day. You can join us for a half or full day glacier hike on the Root Glacier, try your hand at ice climbing, paddle an inflatable kayak or enjoy a tour of the historic copper mining town of Kennecott. An upgrade to a river raft trip is also available. Lodging and meals included once again. DAY 7 – Today you’ll head out of McCarthy by van to experience the 60 mile gravel road that you missed on the way in. We follow the path of the historic Copper River and Northwestern Railway until Chitina, then join the Richardson Highway over scenic Thompson Pass. 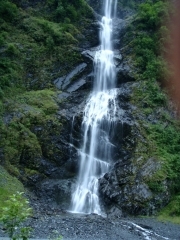 We can take our time to stop and explore near the pass before heading past the lush waterfalls of Keystone Canyon and into Valdez. Meet with your sea kayaking guide this evening, do some laundry, and prepare to head off to the Columbia Glacier the following morning. Lodging included, meals on your own. 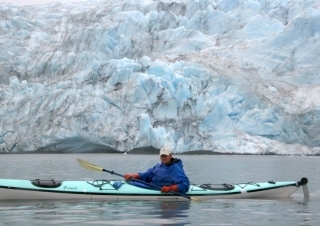 DAYS 8-11 – Columbia Glacier Sea Kayaking – You and your guide will take a water taxi through magnificent Prince William Sound to Columbia Glacier Bay. You’ll spend the next 4 days kayaking amongst icebergs, taking side hikes for awe-inspiring views, exploring Glacier Island and seeking out the abundant marine wildlife such as sea lions, otters, seals, many different birds, bears, whales and porpoises. Return to Valdez the afternoon of Day 11. Lodging this night included, meals on your own. DAY 12 – Say goodbye to your guides this morning and head on your way. You can can book commercial flights from Valdez back to Anchorage or continue on home (flights this day not included). Bon voyage!